Halkidiki, Chalkidiki, Agio Oros, Olynthos, Potidea, Macedonia, Makedonia, Hotel in Greece. 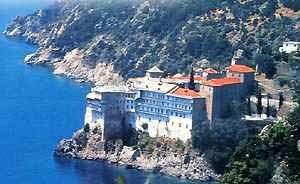 Halkidiki, the highlight of eastern Macedonia. There are numerous archaeological sites, including the Temple of Zeus Ammon on the shore at Kalithea and the ruins of ancient Olynthos on Kassandra. The countryside, with pinewoods and olive groves, is ideal for peaceful walks. Kassandra and Sithonia shelter the north's best beaches and are both fast-growing holiday destinations. 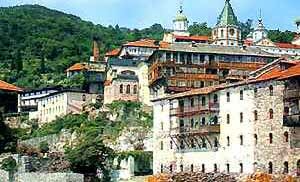 Here also is the religious community of Mount Athos, which can only be visited by men with a special permit. No women are allowed in. This is issued by the Ministry of Foreign Affairs (tel: (210) 361 0581) or by the Ministry of Northern Greece, Directorate of Civil Affairs at Odos El Venizelou 48, Thessaloniki. Tel: (2310) 264 321. Overnight stays are forbidden for those without proven religious or scholarly interests in the area. Potidaea: The city of Potidaea was located near the narrowest point of the peninsula. It was an important classical city whose rebellion against Athens helped cause the Peloponnesian War. Olynthos: Olynthos is of special importance since the person who excavated it, David M. Robinson, later donated much of his collection to the University of Mississippi. You can see much of the collection online at the David M. Robinson Collection. The excavation of the Archaeological Site of Olynthos was important because it provided quite a lot of information to scholars on the average Greek homes of the period (4th century B.C.) (the Bouleterion there was also found). It also provides a firm date for pottery styles since almost the exact date of its destruction is known and no other habitation at the site disturbed the material. You can see a scale painting of the same mosaic (along with several others from the site) by the German archaeologist Baron von Peschke, who recreated many of the mosaics at Olynthos. Holidays in Greece, Hotels, Lodgings, Resorts in Greece.